Got a few questions on how the vdrive is put together. Let me preface this with was on the river today and got around 1 mile up river surfing and having a great time then a pop. Hit absolutely nothing, propellor is perfect. Dead In the water not another boat in sight. No cell service, we floated drained all water spun paddle wheel to get wedge to stow position. Then swam this big arse boat with current all the way back to ramp. And had to load by hand. Made for a long exhausting day. Especially that last 2 foot wenching boat up. Ok as you can see in pic the red arrow points where a bolt is sheered back in the hole a little but blue circle still has a little bolt shining through.looks like about 4, 5/16 bolts that sheered off. The oil in vdrive looks to be clean and no metal in it. Boat has roughly 84 hrs. Anyone know if this is a pretty easy fix or have a breakdown of how that bolts together to see if the bolt heads could be inside the vdrive now? That's an odd looking V-drive. I've never seen one in a Malibu where they pass the shaft through the V-drive unit. Does it spin if you put the boat in gear? Will it go in gear? You sure you didn't just shear a prop key? It passes through. And the bolts are sheered. I wedged a cup holder between it and a plastic case as a Shem against fuel tank and held it locked in and everthing turned fine but kept jumping out. Couldn’t keep it held. I've seen something like that happen before. It's probably best to call your dealer, tell them what happened, and have it fixed using the Indmar warranty coverage. Dealer is swamped. And had rather do it myself in a few hours than haul boat 4 hrs wait weeks and haul back 4 hrs again. Most of the new ones are that I have seen, including my 2016. Spike, sorry I am not much help on the repair, but would hope as an M buyer dealer could squeeze you in or offer a loaner for you. This is a repair within reach. I just swapprd my prop shaft in a 03 25 LSV and what I am not seeing on yours is how the trans output coupler is attached to the trans. My shaft coupler is turned 180 degrees and that bell flange actually fits into the trans output coupler. The shaft still comes through and bolts as yous does but it is definitely possible to remove the prop shaft coupler and slide the shaft out whmatxh your prop on ruder but from there you should easily be able to tell what happened. In your pick it looks like you are showing some sort of thraded peice jammed between the trans outout and the trans itselt. The fact your prop shaft is showing between the trans output and shaft coupler is what has me puzzled any way to take a pic from the side or underneath. I would love to see how that hooks up. This is not trans end. The vdrive bolts to the trans on other end. This is where the prop shaft come out upper end of vdrive. The flange in pic, it’s lower half bolts to vdrive output shaft with 4 smaller bolts that are put in from inside of vdrive. And then the prop shaft is through the middle and connects to upper half of pictured flange with the big nut and it has a keyway. Its all pretty scarred up and I’m wondering if bolt heads can and may have fallen into vdrive. 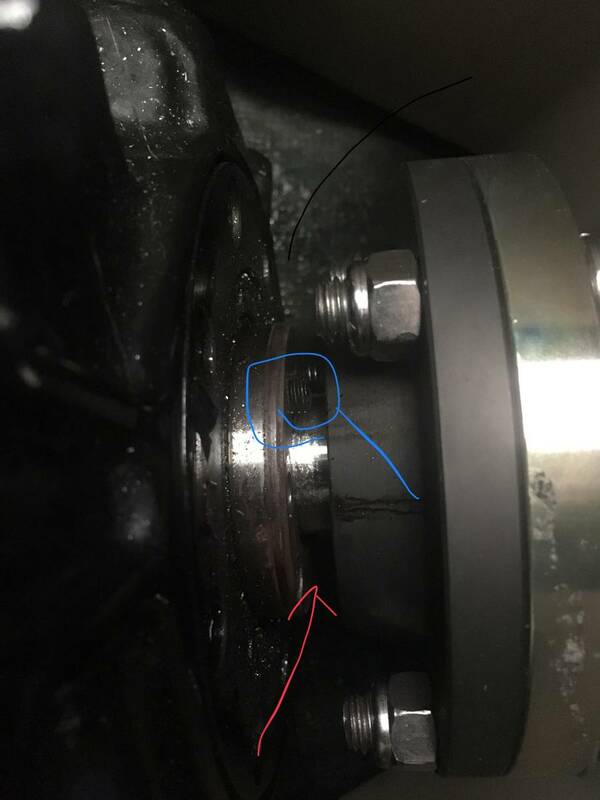 The warranty repair will likely be replacement of the vdrive, but if you want access to the vdrive flange to replace the bolts and pins, the prop shaft will need to come out. The easiest way I've seen is to remove the floor panels (and in some cases the rear bench), drain the fuel tank down to a workable level so the hoses and fasteners can be removed, push the tank on its end out of the way, then remove the prop and coupler bolts and pull the shaft out from the inside of the boat. Sometimes the broken bolts and pins can be very difficult to remove from the vdrive. Nice, what are the challenges with just pulling the rudder and sliding it out the other way. I am sure there is a reason as the floor removal and draining gas tank may be difficult. Just curious. 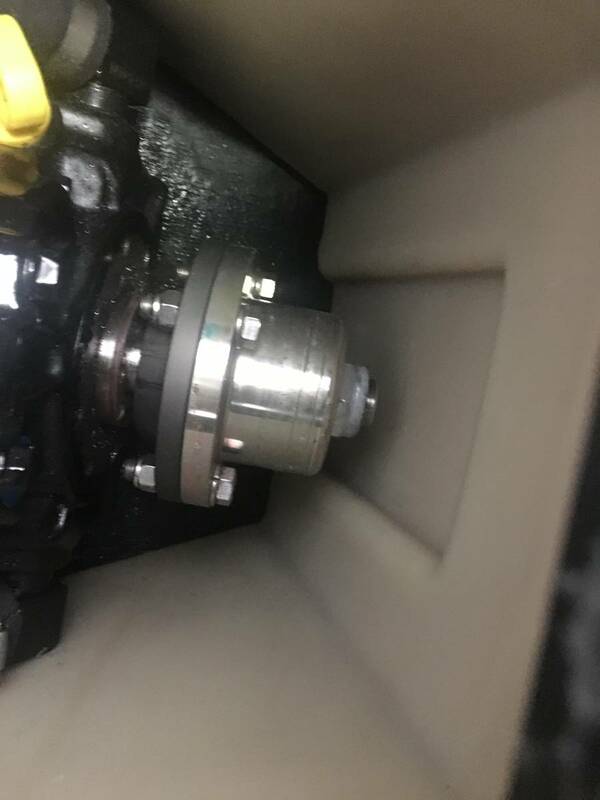 The biggest challenge I've found with pulling the through-drive mounted shaft from under the boat is getting the shaft coupler off (which is difficult even with a specialized heavy duty low profile puller), then still not having enough room to work inside the boat. What's the deal with the pass-through shaft anyways? Is that to get a different shaft angle or something than the older units where both Input and PTO were on the same side? I don’t know but it just occurred to me they could all be considered direct drives now?? Taking any shaft coupler off is no fun in a v drive. Still in this application, you can use the threaded bolt method to make the coupler pop off. Slip the side of a box wrench between the coupler and the drive face, use 4 pieces of threaded rod and crank away until it comes off. 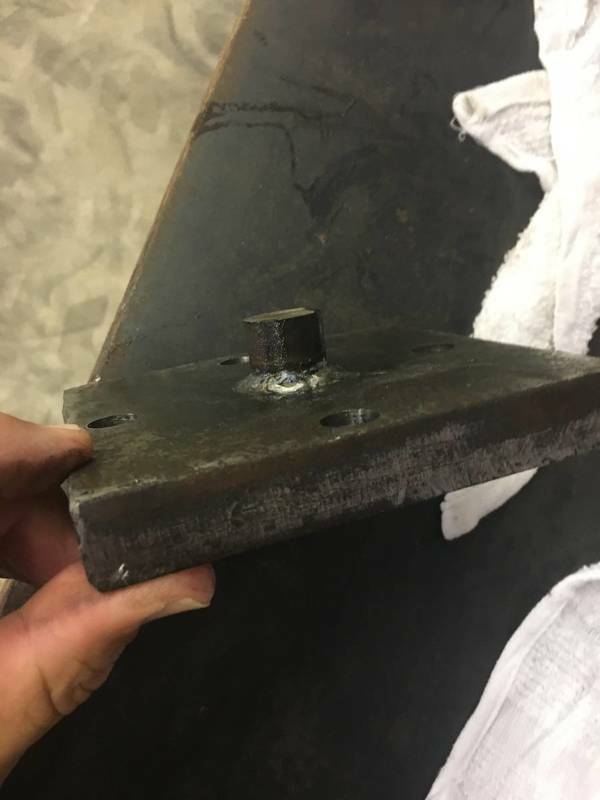 So could the motor mount nuts not being locked down cause the misalignment that led to the failure? I doubt it. I've heard chatter mentioning Indmar having a bad batch of bolts from a supplier. That sux for that supplier, so that means this is happening to a lot boats? Only a handful from my contact. Not sure I’m following. What then Holds the prop shaft? The strut bearing assembly?? In my experience, the shaft doesn't suddenly slide out of the boat/strut. It has always stayed there until I pulled it out of the boat. Top tip is to have your prop removed before taking off the coupler to avoid hitting the rudder, in the event that the shaft does begin to slide out. No I mean I hat pushes end of shaft out of coupler flange? I understand the 4 all threads but I don’t see how and end wrench between face of drive and flange will pull it unless the prop is against the strut on other end? All threads go where the bolts are I assume blue arrow. But what would be against end of shaft where red arrow is to push it out? It explains with pics how to get the cap off. What I think you're saying is how will the cap pop off without pressure on it, and in the link they show to slide the wrench between the cap and coupler. Thanks. I appreciate the help and the link. All I can say is wow, that guy was lucky. 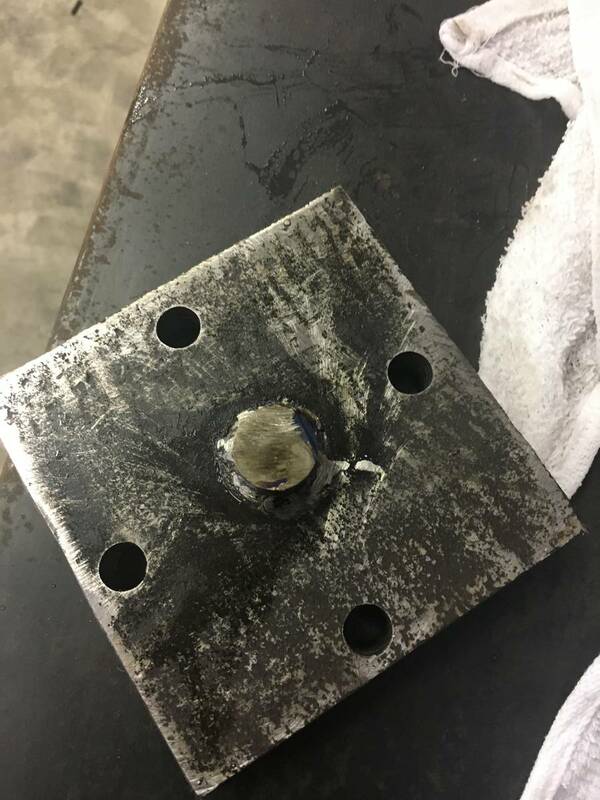 He literally tapped it out with a hammer The end wrenches we’re doing nothing to pull it off except to protect vdrive flange. When I pulled mine last night with a puller it was bending the 4 allthreads before it finally popped. And was also tapping with a hammer to ping it.